Indigenous peoples living in the Isiboro Sécure Indigenous Territory and National Park (Tipnis) are concerned that the construction of the San Ignacio de Moxos-Villa Tunari highway continues, including with the construction of bridges; they add that these works seriously harm them and that 65 populations will be affected not only by the passage of said road through that vast territory that would be divided into two parts, but by the fact that it will lead to the opening of small roads in the forest that they be colonized especially for the cultivation of coca and “reign of drug trafficking” in the region. A special commission of the International Rights of Nature Tribunal (IRNT) visited the region and after overcoming difficulties to enter many parts of the Tipnis territory, drew conclusions that are alarming about the progress of works on the road. In a meeting held with 28 representatives of the 65 indigenous communities that inhabit the region, their problems and approaches were heard about the urgency of suspending work on the highway and the incursions of coca growers who, to begin with, have planted a lot of coca in the “Polygon 7 “. These are committed to getting much more territory for these crops and that they are clear lands on the banks of the road that “was discarded long ago, but later passed Law 969 in August of 2017, which removed the condition of intangibility to the territory”, new incursions by coca growers were facilitated. The commission of the IRNT, composed of an Ecuadorian, an American and an Argentine, had problems entering the Polygon 7 and could not do so because of the opposition of those who inhabit it, claiming that “they were not invited”; after being practically imprisoned for five hours, they returned without having achieved their objective of checking the complaints received on the site. Later, in a meeting with the government authorities, after receiving criteria and opinions on the Tipnis, both the minister and the deputy minister of government “ratified the intention to build the road, although they acknowledged that the final design of the road had not yet existed neither the evaluation of the environmental impact that it will cause in the Tipnis” (ED 23-XII-18). The problem is serious and any negative report for the government would have repercussions of international character. The important thing is that both at the level of international organizations and countries that know the problem there is awareness that the Bolivian people and their institutions condemn any action that is taken against the rights of 65 indigenous communities of the Tipnis, especially for the construction of the highway that would divide the reserves that are populated by many communities that do not want to be displaced by coca settlers and open forests and jungles for exploitation and destruction of nature. 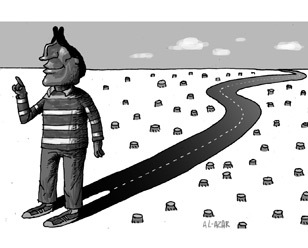 Bolivian Thoughts opinion: This cartoon from La Razon 12/11/2012, shows the coca leader and self-proclaimed Mother Nature defender pushing relentlessly this road that will cut in half the TIPNIS, evo only cares about the private needs of the coca growers: expand the area for the illegal cultivation of coca which turns into cocaine. This damage to our biodiversity will also place in peril the path for wildlife between Peru – Brazil – Bolivia – Argentina, this is more serious than what it appears!